Late last year, Kiwirail announced they would stop running electric trains through the Central North Island in favour of just using diesel trains, a decision that seems absurd. On Friday, OneNews reported on leaked documents suggesting the analysis that lead to that decision was deeply flawed. Leaked documents throw into question a controversial decision to dump electric trains for diesel locomotives between Hamilton and Palmerston North. KiwiRail announced the decision last year, and said diesel would improve reliability and efficiency. But an external peer review by engineering consultants WorleyParsons warns diesel trains bought from China have “a very high failure rate”. Seven to nine are out of service at any one time for maintenance, repair and asbestos removal. And their performance has been “extraordinarily poor”. The review said KiwiRail should be switching its whole fleet to electric, but it said a paper from the company’s board was “biased towards the diesel option”. And there are more concerns from a separate internal report, which says KiwiRail over-inflated expected savings – and upgrading electric trains was actually $230m cheaper than replacing them with diesel. Double counting savings from closing the electric locomotive depot. Over representing the costs by $38 million by overstating the maintenance costs. For their part, Kiwirail say this. KiwiRail says the reports were written in 2015 – a year before it made a final decision. Chief executive Peter Reidy says there were three or four reviews. “It matured all the way through, so the initial information that we were looking at at the start looked very different towards the end,” he said. At the time they made the announcement, they did release some documents however much of the detail, such as the specific costs of the options, has been redacted. One thing that was quite interesting were the comments by Simon Bridges. The electric trains will be phased out in the next two years. But Transport Minister Simon Bridges says the whole line could be electrified in the future. “There is an avenue down the line for different decisions to be made … we can revisit this in due course – if we decide that’s the right thing to do,” he said. This review is pretty shocking given the decision they eventually released. I don’t think there is any way the Kiwirail can reassure kiwis with platitudes of “we know what we’re doing” now that this report is in the public light. If they’re relying on other information that means it won’t cost NZ $230m more over the 30 year time-frame, they need to release that. I appreciate the candour of this internal report with regards to how badly the current crop of DL trains are performing and the public really need to see how that has changed (if it has) and how we’re not just throwing away $230million on what seemed like a crazy decision even at face value. I wondered whether it was a cry for help from Kiwirail or for them to try and force the government’s hand to extend electrification. This was only a cry for help if they intended for that report to be made public. If the Minister seriously does want to do the ‘right thing’ surely the best thing for now is to rehabilitate the current Electric Locos as that requires the least capital cost and doesn’t commit KR to years of costly diesel use, repairs, and inefficiencies from buying yet more poor quality Diesel locos. These reports make it clear that it is a false a choice to argue the only alternatives are either: 1. electrifying the whole network or 2. abandoning the Te Rapa to (nearly)Wellington section and doubling down on fossil fuels. The time losses due to loco changes between systems are being overstated. So there is a range of options from getting more lift out of the EFs, which is the cheapest, right through to a programme to electrify more of the network. Buying more Diesels now for this route, is beyond backward looking. The middle option of ordering new Electric locos and extending electrification from Te Rapa to Papakura over the coming years looks like the sweet spot to me. Starting with the Papakura-Pukekohe section in order to extend EMU service south, and opening up the option of an EV HAM-AKL passenger service. But if that is beyond the vision of the big end of the cabinet table (who really believes KR are making these decisions?) squeeze more life out of the EFs, and save the capex for ‘the right thing’ later. While I think the electrics have a place in the future of NZ rail there are some points I think you have wrong. 1. To refer to Palmerston Nth as “Nearly Wellington” is like saying Tauranga in nearly Auckland. 2. The units operating under the central NIMT electric wires can’t operate under either Auckland or Wellingtons OLE. So there is no real advantage of extending the current network. 3. Electric passenger services to Hamilton will be required to be compatible with Auckland OLE, so still doesn’t allow central NI services to continue past Te Rapa. 1) Yes valid point – however the distance between the AC and DC networks isn’t that great. 2) They would be able to operate in Auckland with a relatively minor upgrade. It might be possible to upgrade them for DC running in Wellington as well but if the whole network was going to be extended then would make more sense to get new AC/DC loco’s or upgrade Wellington to the international standard AC like the rest of the network. I think the new Matangi’s either can or can be upgraded to run on AC. 3) As per above they can easily be upgraded to run on the Auckland OLE. Multi-voltage locos are common around the world. So none of those issues are insurmountable. 1,500 V DC & 20 kV AC (so combo DC and AC). I’m sure these could be easily modified to 1,600 V DC and 25 KV AC for NZ applications. The Toshiba company is not doing well at the moment, they would probably do KiwiRail a deal. Indeed, the NIMT locos would almost certainly have to be replaced, not only due to their age but also because they probably produce far too much electromagnetic interference to be compatible with modern signalling. There’s possibly also an issue that they might need different pantographs for Auckland & Wellington. But as others have said, that’s no biggie, there are plenty of manufacturers who can produce appropriately gauged stock that will run on both voltages at a reasonable price, plus a low HP diesel engine which would be enough to shunt wagons around a yard or get a train out of the way in the event of a power failure or a dewirement. Auckland’s power supply will probably also need to be beefed up to manage the extra draw of heavy freight locos, but again, that’s not a massive issue, it would probably have to be done in the long-term anyway. Also, expansion of freight services out of Auckland probably requires a third and ideally fourth main line out of Auckland to keep out of the way of suburban services, but that should not be a prohibitively expensive proposition – it’s a long-term investment and as such should be a worthwhile investment. A new pair of tracks should make long-distance passenger rail services much faster and more feasible, so again, it doesn’t seem unreasonable to borrow the money to do it. The current EF electric locomotives are noted in one of the leaked reports as having fundamentally a sound body, chassis and bogies. In particular, the smooth ride of the electric fleet indicates they are easy on the track despite their 18 tonne axle load. The Chinese built DLs cannot go above 80kph safely and will likely have a mush higher degree of wear and tear on the track – yet another black mark against them. In short the current electric fleet is a good platform for a partial upgrade or; a complete gutting and rebuild with completely new equipment that would address all the current age related reliability issues. Refit cost will be a big factor – I am unsure what level of upgrade is most cost effective. In reality, in an expanded electrification network, or expanded traffic over their current sphere of operations, the current fleet would need be supplemented and will ultimately be supplanted by additional electric locos. This decision, once taken, will soon become irreversible. Without maintenance the OLE equipment will soon fall into disrepair (a few years). Then there would be a large start up repair cost. Indeed, the power cables will probably be removed for storage. This makes me wonder if one of the real “savings” intended is to stop maintaining the OLE, or if they have already done so and face a liability to bring it up to scratch. DC current is pretty inefficient for long distance rail. That being said you are correct, voltage conversion equipment can be done by digital step transformers. This allows trains to run on AC and DC current. For tram trains running on both LRT DC and heavy rail AC power in Germany, the extra power systems and electronics costs <$1 million per LRV. Not cheap, but hardly a determinant in a decision of this size. The EF’s remain our most powerful locomotive but are now 30 years old or thereabouts. They have become unreliable and are probably past their used by dates but could be revived, if I recall correctly for a bit less that the price of a new DL. However the biggest flaw in the system is the electrification is in the mid North Island only, an area that does not make money for Kiwirail. Even if it made it to Auckland things would be different. I understand the DL’s are now a lot more reliable now but they are a flawed machine. Incredibly its designers did not trial an experimental version here, they just gave us an off the shelf version but then were horrified when discovered how bad our tracks were when the first generation came out here. They were supposed to be capable of 100 km/hr and are but our track condition and their bogie design meant they were unsafe at that speed or at least would be intensively high maintenance were they used at that speed. Kiwirail is a cash strapped and at this time, rather marginalised organisation. If we had a government that was concerned about climate change, electrifying the North Island lines would have been a priority as would the funding, as would investment in rail. We don’t have that kind of government, we have one that led Trump in that respect. So a cash strapped organisation has to make do with what it has, doing less with less, vis a vis, nearly all NZ government departments! So would it not make more sense to go for the option that is not only less capital intensive (refurbishing the EF) but also lower running costs? That’s not even going into the fact that EF are faster/better. I also fail to see how a section that is supposedly unprofitable (but needed for the network) could become better by buying new diesels that are more expensive, have higher running costs, are unreliable, slower and more polluting. The government should step in and build Pukekohe-Hamilton (and have their little win in making AT pay for Papakura-Pukekohe if they must). Ooops, Looks like those EF locos will now be refurbed, updated and become integral to KR’s future plans, especially if that wire gap AK to HAM gets strung. An opportunity lost for AT to get some EF/SA/SD trains into action to fill the timegap until new EMUs get here. The internal report says in pretty much as many words (2.2.2) that noone bothered to take routine steps to find out the real diesel maintenance costs. In other areas (e.g. 2.3.1.1) basic mistakes were made, but that one is about knowing how to get information and not doing so. That suggests there isn’t some other information somewhere. This just wasn’t a decision based on facts. Kiwirail spent quite a lot of money on a fuel saving device, driver advisory system (DAS) a couple of years ago which promised rather large percentages of fuel saved. I wonder if the desire for DAS to appear successful clouds the figures somewhat. Sign the petition – https://www.facebook.com/sharer/sharer.php?u=http%3A//action.greens.org.nz/save-our-electric-trains and lobby the ministers – http://action.greens.org.nz/save-our-electric-trains-next-step?utm_campaign=rail150517signr&utm_medium=email&utm_source=nzgreens. How much longer will it take to update the study still on the Ministry’s website at http://www.transport.govt.nz/research/othertransportresearch/understandingtransportcostsandchargesuttc/? The rail number will have improved significantly since 2005, especially with the AKL passenger boom, but also rail freight growth. But yes, all transport is subsidised. Choose the best type to subsidise more! And don’t ignore externalities… including carbon and other nasty environmental effects. +1 Patrick, also into the future with more freight services the cost advantage of EF over diesel would grow even more (the OLE will have it’s costs spread over more trains and since EF can haul more could have larger trains). This is a once per generation opportunity [and cost] to undo the bad decisions of buying asbestos ridden cheap chinese locos and lock in another 30 years of benefits from using electrons to move railfreight. Second with a Electriifed Hamilton to Auckland route available, AT can then look to extend services to Pukekohe [and beyond, to Hamilton]. And all for much less than the cost of the East/Waste motorway Limited Access Arterial. I think if any lessens should have been learned from Kaikoura, is that a mono-modal policy for freight movements using roads only won’t work, our roads are simply not up to the task. Even if everyone bought electric freight trucks overnight, the roads themselves will need constant repairs to keep them operational for heavy freight trucks. If they are going to electrify Papakura to Hamilton they might as well go through to Mt Maunganui now as the majority of trains that run Papakura to Hamilton are going to Mt Maunganui so would still be have to be diesel. Well, any roll out of overhead infra can only happen over time, so yes work to a programme. But there is little problem with either still running Diesels between AKL and Tau, or changing at Hamilton until that is complete. Especially as running electrics into AKL from south will free up more existing Diesels for the important Tauranga run, in the meantime. +1 Patrick, Greg and Jezza. The way the world is going all ground transport will be EV very rapidly. What about murapara or kawerau.?. Or kinleith?. A lot of trains run to or from small places on branch lines to pick up logs or pulp etc. Even if you electrify auck-ham-tga many if not most of the trains would still be deisel unless you electrified all the branch lines also. Metroport trains and some others would be ok though. So the problem then becomes this. Do you spend a lot of money electrifying to murapara in the middle of the ureweras ?. And other branch lines?. Or do you just electrify auck-ham-tga and still have a lot of deisels running on the line anyway which makes the electrification much less effective?. For those smaller branch lines you either just need shunting loco’s or you have larger loco’s that take them to the main trunk etc where an EF can take over. Log’s aren’t particularly time sensitive freight. Matthew I think most trains from Murupara and Kawerau are just heading to the port at Mt Maunganui with their export cargo so no need to electrify this big section. I see your point with Kinleith, but I suspect it makes up a relatively small proportion of the trains running through the Kaimai tunnel, so electrification would still be worthwhile even if there were some diesels still running. Diesels run under the current electrified stretch of NIMT. This just shows how unaware people really are of KR’s operations. The ECMT railway is by far the busiest route in the country, AND the only profitable route in the country. Electrifying for freight Papakura to Te Rapa would need to include the ECMT as well, or what really is the point? The NIMT IS NOT a profitable route. Buying new electric locos for the central section that is currently wired is not a cheaper option for KR. Okay, go buy some electric locos to replace the EF’s…. who is going to then pay for costly overhauls of the overhead if required? The concrete poles look near naked in a lot of places, other bits and pieces look very rusty. The overhead falls down now and again from time to time(every six months) because it most likely needs an overhaul. Time, money, safety resulting in broke$$$, unreliability, people with their lives at risk. The only thing I see that would make this viable is a combination of freight and passenger. And that would require quite a decrease in running times to generate the patronage to get folks out of their vehicles. I keep reading on these types of forums/blogs that it will all happen very quickly, everyone converting to train travel, electric cars… but it doesn’t seem to be now does it. It would also require a major increase in freight tonnage up and down the NIMT. Something of the equivalence to the ECMT (about 30,000 tonnes per day minimum). These contributing factors and MANY others need to be accommodated in a much longer term plan (example, new alignment Papakura to Mercer tunnelled through Bombays). But I don’t think the governing authorities have the capacity, mentally, financially, and neither the passion to give us what we need. From what I hear, the overhead is in pretty good nick apart from one or two locations where particularly soft ground creates ongoing maintenance. The “OK” condition of the overhead can be backed up even by the current KR management, who have decided to retain the overhead live. If there were structural issues, there would be a much stronger business case to dismantle the electrification in its entirety. SCJ the report says the existing overhead has 30 more years of good life in it. Additionally your argument is based on a false premise that electrification of one line is ‘useless’ without electrification of another. Just not true; Diesels can continue to work the ECMT and electric the NIMT for as long as necessary. This is similar to KR’s unconvincing overstatement of the efficiencies to be gained from having only one kind of propulsion. In any case electrification of the ECMT must be a medium term goal too, for all the obvious reasons, and the first step towards this is to complete the gap between Te Papa and Papakura. This kind of investment in long lasting public infrastructure should not be on KR’s books, in the same way that the construction Transmission Gully is not on Mainfrieght’s or Toll’s. Yes they should pay to use it, but not build it. Opex is about use in the present, Capex about value in the future, so we socialise the cost. In the case of Transmission Gully (for example) private motorists in Pakuranga and Papanui are taxed to deliver it, most of whom will never drive it. This is fine, it is for the greater good, we should do the same with all infrastructure of value, not just one kind. The ECMT and NIMT services are both profitable. The freight operations on New Zealand’s rail network turn an enormous profit. This is almost enough to maintain the network that they run on, this isn’t even close to true of road freight. Is this part of an election project they are running out called “Think Small” ? More, I suspect, default National ‘Think mean’. Be great if they do commit funds to extending electrification to Pukekohe in the budget. Anyonw know why when electrification of the NIMT was done in the 1970s/80s they only went between Hamilton and Palmerston North instead of the whole Auckland to Wellington route? One of the main benefits of electric trains is more traction power & regenerative breaking. This has higher dividends on track with tough grades then ones without which that section of the NIMT has. They did have plans to do the whole thing however the whole Think Big thing ended up costing the country a lot of money and oil prices dropped away in the 80’s and 90’s. The main purpose of it was for the difficult section over the central plateau where the greater power and traction of electrics made sense (and still does today). Auckland-Wellington, Hamilton-Tauranga. Get those done and that covers most of the main rail freight. South Island can remain diesel in the meantime as can North Auckland Line and East Coast Line. Taranaki might be worth considering at some future point if it makes more sense to have that part of the electric network but probably not. Thing is you can still run diesels under electric (or even get dual-mode loco’s). For akl dude. I think that would be more inefficient than what they currently do though. Instead of running straight from kinleith to tauranga, you would have deisels taking the wagons to the main line then changing locos. Requiring more locos for each trip. More drivers. More chance for one to break down or driver call in sick etc. So in summary i think you would spend heaps on electrification , heaps on new electric locos and then run a more inefficient and expensive running pattern. I dont think that would be a successful business case to take to the govt for funding . Matthew, the idea is to take advantage of the network effect – a bit like the new PT network for Auckland instead of having lots of buses running multiple cross-town routes you have them hub instead. Get those logs into the Tron where they can be all put together into a larger train to Tauranga (be it all logs or other freight added too). There are significant cost savings to running larger trains – especially if they were electric. In the meantime your smaller log train could be shuttling around the various spurs. Where would Kinleith currently take it’s logs to now anyway? All the way to Tauranga straight from the mill once so many wagons are full, or do they? There are only 4 trips daily . Less than i thought. One to ham and 3 to tga. And someone above said murapara trains terminate at mt mng which is right so i drop my objection. electrifying that line might be a goer. But akl dude i dont think you would get the attach on the junction between lines. Better to just run the deisels the whole way. Some of those trains from kinleith are already pretty big. Is there an under table deal between NZ government and China for political reason? Or is the kiwi rail officials took some benefits from china? This is a common practice in China. Would not surprise me Kelvin, the Nats are up to their eyeballs in bed with China – Just look at Bulldog Collins. im sure the chinese could make some electric locos. Yes that is true. Probably end up fused to the rails at some stage or having a catastrophic failure due to dodgy steel in their construction though. You only have to look what happened to Fonterra and Zespri who suddenly encountered problems in China as soon as there was talk of an inquiry into dodgy Chinese steel. China has coercion down to a fine art. Sparking up to Hamilton would also need some serious infrastructure improvements (i.e in the Swamp) to make it worthwhile, would it not? Thank goodness the lid seems to have been lifted again on this very inadequate decision. Well done Greens for not letting this inadequacy remain covered-up. I’m sure this is a sound commercial decision. But it also illustrates the perpetual failure of government and integrated planning in NZ, and how climate considerations are almost inconsequential in NZ’s political and business environments. 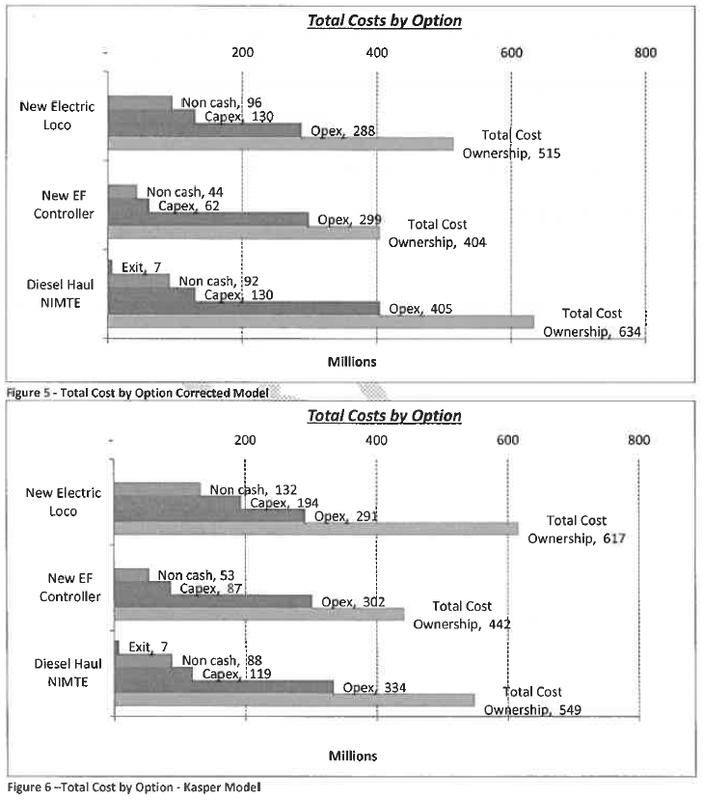 Those cost option tables, this is for alternate loco fleet options for operating the NIMT? Are the costs for the same numbers of locos, eg 30 EF, or is it just the 22 EFs left? So that’s 22 new electrics or 22 DLs? Wasn’t KR talking about just needing 8 new DLs to replace the 22 EFs or were they counting use of some existing DLs in addition to the 8? Interesting comment and very legitimate however its like in a a mirror looks the same but reversed. The business case that is. The case for dual power diesel electric has not been put and this type of solution is common place overseas. The stated 1 billion or 4 billion upgrade to the NIMT line is not immediately necessary if a decision to get dual powered locomotives is made. The supplier of the Auckland EMU’s CAF is also a manufacturer of this type of Loco and we have an established relationship with this company. There may be a disparity of tractive effort when running dual Diesel as opposed to dual Electric but as the non electric portion is shorter and less hilly I this this should be studied before shooting off to China to buy some more DL locos. Perhaps get two dual mode locos on lease or buy outright to trial and prove the result the cost may be less than the fuel bill over a number of years running all the way. I suspect that it would be very challenging to design a dual mode electric- diesel locomotive, with anything more than “last mile” diesel power output within the 18-20 tonne axle load constraints that KiwiRail requires. If that is the case then dual diesel/electric loco’s are currently in the 30+ ton axle load range compared to 17t for the EF and 18t for the DL. I wonder if perhaps there is a type of diesel loco out there that is overpowered in terms of acting mostly as a power generator (mobile mini powerstation)? Have your 2x EF (or replacements) and have a overpowered Diesel hooked up to provide the leccy for the EFs on the relatively flat sections that don’t have OLE. Or just string up to Hamilton and not worry about that. The thing is that diesel have to operate from Palmy to Wellington anyway due to their DC network (unless they buy new dual AC/DC loco’s) so it won’t change the transit times at that end but will speed it up at this end. I’m wondering why there is always so much sensitivity and secrecy with anything to do with China? After all, we’re constantly being told they’re our friends. Because China is one of the most corrupt countries in the world it’s Transparency International’s Corruption Perceptions Index Ranking (fluctuates from 79th to 100th in the world) means it rubs shoulders with Algeria, Suriname, Armenia, Colombia, Egypt, Gabon, Liberia, Panama, Bolivia, Mexico, Moldova and Niger. – Very illustrious company. They are also very sensitive petals who throw a temper tantrum over any criticism or negative thrown their way (e.g they sold NZ dodgy steel so we mentioned we might look into it and they then threatened to block our exports of Kiwifruit and Dairy as a result – despite our Kiwifruit and Dairy being of the highest world standard). They most certainly are not our friends (although I’m assuming you said that sarcastically), or any other countries friends for that matter. China is interested in one thing – China, they will play the game and pretend to be nice to get what they want. Even Russia and North Korea of all places are wary of China and China is North Korea’s best “friend”. AKLdude – I’m not sure there is really any “us” and “them” any more. Auckland being now predominantly a Chinese / Indian / Maori city these days (or if not now, then it will be so within the next decade or two) then we are therefore all the same these days. So: China is us now. We are all Chinese…. I suspect the cheapest short term solution to this would be for the government to simply subsidise Kiwirail specifically for the costs associated with running a double fleet and changeovers at Hamilton and Palmerston North. While I’m not usually a huge fan of subsidies, it would be a relatively cheap way of ensuring electrification stays in place for the inevitable electrification of Papakura to Mt Maunganui at some stage. The Kiwirail management and board deserve the sack. The DL locomotives use DC motors rather than the more modern AC motors and as a result are very prone to flashovers, which put them out of service until the engines can be repaired. Add to this the fact that they were full of asbestos and you can see Kiwirail were sold a lemon from Day 1. Additionally, the supposed time savings in not having to stop and change at Hamilton are approximately 10 minutes. All you have to do is uncouple the diesel (or the other way around if northbound), drive it away to a siding, then bring up the other locomotive, couple it, do a brake test and you’re away. The reality looks like Kiwirail have a Government mandate to run themselves into the ground, necessitating their own closure so that trucks can rule the roost. Can’t have anyone competing with one of National’s main donors, the Road Transport Forum, can we? Pouring hundreds of millions into KiwiRail is hardly running it into the ground. This is more about appeasing China by buying their crap locomotives. Good article, but the main point is that KiwiRail lied. Even just take the faux Q&A the KiwiRail put out justifying their diesel decision. They said that independent consultants were engaged. And they were; some excerpts from their report appear in this blog post – hardly a glowing endorsement. How much development is slated along the Auckland – Hamilton corridor south of the Hills? upgrade option viable so the purchase of new electrics may be more realistic. Has anyone used the OIA to get a copy of the leaked reports?